I recently had the opportunity to send some interview questions to Moonspell's Fernando Ribeiro, who took the time from a very busy schedule to give in-depth and informative answers. Enjoy! First and foremost, congratulations on the release of your new double album Alpha Noir/Omega White. With such an ambitious project now in the hands of your fans, how do you feel about the final results of your work? Thanks a lot. We actually feel good about it and only hope we can translate this enthusiasm to the fans. We know that not all the times our efforts are easy to digest yet we can't help ourselves and always try to thread some new waters and concepts when approaching a new album. Lots of people told us we were crazy to come up with something complex, that demands more attention from the crowds than your usual bi-annual record, but we would not break the artistic integrity of our idea for no commercial or scenario. For Moonspell, the ability to achieve some depth with our music, it's vital and I see everytime more bands keeping it safe while predictable. I reckon that is a smartest way to be on the scene but to be honest I always identified more with the struggling artists, the ones who flirt with the curse of oblivion whenever they release their work, on the verge of winning or loosing or just juggle with indifference. As long as the ideas are there, for posterity, we're happy. The rest we have to fight for, step by step. Almost four years exactly passed between 2008’s critically acclaimed Night Eternal and 2012’s Alpha Noir/Omega White, which to my knowledge is the longest wait between your albums yet. What were these years like for Moonspell, and how did that culminate in the new album that we have today? Memorial and Night Eternal were a very important sequence of records for Moonspell. In retrospect, I believe these records were truly what made the difference for us and allowed us to stay put and keep our heads above the waters. I always state this because this is the way we feel abut those albums. They brought us a lot of good things again and to be able to tap into a new generation, to keep on touring, to achieve the results we had with those two, it was really fantastic for us. Make no mistake, this is a scene that is always looking for the next big thing and the bands who are shooting stars now have very little to do with what a band such as Moonspell represents. Most of the bands in our style or league have vanished in the end of the nineties and the few who carry the flame have many times to deal with indifference and get their way around it. New bands are always showing up and the kids might have a hard time to relate to a quasi avant-garde, atmospheric metal band from Portugal. With that in mind, we thought we should bring some in return to the band and the best gift we could have for the songwriting was time. To spend time on the songs, arrangements, production. Four years went by without us noticing. We were doing shows all the time but we had a firm engagement within the band and the day after a show or a tour we were in our studio, working on the album, possessed by it. It sounds somewhat romantic yet that's what happened. I have to add that all the process was pleasurable, allowed us to discover a different direction and format and we could finaly spend more time with the songs, to follow their lead, to play them together many a time. All that is contained on the new record, which was not thought to be a double album at first, but that after the first demos become one, with both Alpha and Omega songs, growing in different soil, hopefullly gaining momentum and personality, turning a merely ceative principle into a concept. Before even listening to the first song, one has to stop and appreciate the amount of work and detail that went into the package itself (I have the special edition). While some other bands seem to be opting for cheaper methods of production (such as the simple cardboard sleeves I have seen for some albums in stores), the book format and excellent artwork/design is quality in and of itself. Please explain how the various images, particularly the cover art of Alpha Noir, relate to the music and your intentions. There is nothing than a band wishes more than people doing exactly that. But that is not sure. I believe a lot of the romance of listening to music was lost in between the shock waves of getting stuff for free online. It’s very hard to compete with that, even if a band like Moonspell still persevere stubbornly in trying to create more than a record: a complete piece of Art that people can fully appreciate. There is a lot of realpolitik involved now in the making of music and we have opted to go exactly the opposite way with these albums. Time will tell us if we did right or wrong but we already have to put up with so much realistic crap that we really go the extra mile with music, artwork and videos because there we have more control. I see, though, some light at the end of the tunnel as most of our special editions are sold out now and so are the vinyl’s edition. As for the images they all come from the mind of our favorite designer, Seth Siro Anton, which picked up from our songs and lyrics and the several phone calls I had personally with him to build upon them his own world, open of course to interpretation. My insight is that he really nailed it. Alpha Noir cover never discloses if the figures are going to engage in love or war and for me that’s the whole meaning of the album in a nutshell, the unpredictable line between ferocity and kindness we all possess in us. Omega White goes to a more familiar territory and all female figures report to lust, secrecy, loss, like the saint whores of the Antiquity, devouring and inviting. He did a great job handling all that, I am very happy with this artwork, it’s a feast to the eyes. On another artistic note, the video for Lickanthrope is one of the strangest and most intriguing I have ever seen. Like a bizarre twist on Little Red Riding Hood, with numerous wild elements thrown into the mix. Can you explain how this video came to be? The original idea, before Filipe Melo the director jumped in, was to have a kind of a masquerade, where several outcasts from society, literature and cinema (an idea which came later with the director) could get together and celebrate their lifestyle, away from moral looks. Like the chorus states, we are like this, do not want to be saved. The whole idea gained a new breath when Filipe came with his own input, especially the werewolf transformation. I believe this video is quite poetic and it recreates a kind of a tribute to movies we like and so does Filipe who has a tremendous film culture. You can see Spielberg, Cimino, Landis in just four minutes. The whole shooting was also horror movie worthy, with all the long hours, the intense make-up and acting but when I look at it I am kinda proud of it since it gathers, for me, all great elements of a video: mystery, humor, characters interacting. Some people dared to relate it with the Twilight saga, unaware that we wrote Vampiria in 1994, when they couldn’t even read or eat by themselves. It seems to me that Alpha Noir and Omega White are two very diverse sides of the same coin. Almost as if you took the various qualities of previous Moonspell records (harsh vocals, soothing vocals, aggressive riffs, melodic passages, etc…) and split them evenly down the middle. What was your intent in creating the unrelenting aggression of Alpha Noir, and the calming atmospheres of Omega White? Music lead the way for it. All the rest was process and a creative principle that became interesting enough for us to turn into a concept. I think the novelty here is not to cover the range of emotional display you mentioned but the fact that we have now planted the seeds in different soil unlike any other Moonspell album, where we always managed to work out both. Night Eternal is the best recent example with songs like the title track or Scorpion Flower. Our intent is to represent the band, expand a little and hopefully enthuse our fans to listen and to tap into the Alpha and the Omega. Lyrically speaking I found both albums to be somewhat open to interpretation, perhaps even more so on Omega White. You have always written intensely poetic lyrics, and I feel that songs like Incantatrix, Grandstand, and most notably A Greater Darkness stand out on this release. Please explain some of the lyrical concepts (as little or as much as you like!) on Alpha Noir/Omega White. Moonspell lyrics are always open to interpretation and we encourage people to do so. Just the thought that people will sit down and read through them and wonder, it’s a welcoming one. I believe Alpha possesses the spirit of its time. I come from Portugal, a country that has almost 900 years of History and Culture. A guy in Wall Street, who does not even know where Portugal stands geographically, labels my country JUNK. Jobs are lost, families destroyed and the self-esteem of a country, badly ruled by puppets to start with, goes down the drain. This yuppie and his power pack makes a few more millions making years of struggle, achievement, glory, pain and artistic feats falls into oblivion. Alpha speaks about this fragile order of things and the abandonment of humanism in the relations among men. Alpha talks about this jungle and reclaims a new world build upon the ashes of a world we do not want to and have to begin changing through what we do everyday but also through the vehicle we know more: our songs and lyrics. This album is full of metaphor and other resources but the message is to be yourself at all times and dispense salvation of any kind: financial or spiritual. Alpha is the arena. Omega is an album that, lyrically, is more traditional to Moonspell. It serves as a kind of depository of personal emotions that everybody can relate to. Heartbreak, loss, anguish, unfulfilled desire. If Alpha screams, Omega soothes and “night dreams”. Em Nome Do Medo is the only song on both albums not written in English, and is also one of my favorites on Alpha Noir. What is this song about, and why in the chosen language? It’s incredible the way this song got into foreign people who have no clue of what I am talking about. I hope I can shed some light over it. The truth is that this song has become one of the highlights or the album and of the live setlist. Maybe it feels you are under an ancient incantation, but maybe that’s just me daydreaming again. The choice for Portuguese for this song was more of a gut feeling than anything else. True that me and Pedro (Paixão, keyboards) made, together with another Portuguese Rock singer (Rui Sidónio, from industrial combo Bizarra Locomotiva) a project around a great Portuguese writer/poet (Miguel Torga), a 5 track CD based on his book (Orfeu Rebelde or Rebel Orpheus) and that kinda open a door there. You can download it for free here if you are curious about it http://optimusdiscos.pt/discos/artistoptimusdiscos/cada-som-como-um-grito. But coming back to Medo it fully translates as In the name of Fear and this song might be the very first one of a larger record containing songs in this vein. In an era where every other decision is based upon fear be it in the music industry or just picking up something from a shop, I wrote this one as a reflection upon the ways of living scared of…living. I picked up some of Voltaire’s work about the great Lisbon earthquake in 1755, that destroyed the city. This French philosopher wrote a whole poem about it. People felt abandoned by God as they feel today, unable to rely on something, even an entity we have created in, then again, such a fragile world order. In the end it sounded really good for us so the language was, we believe, a right choice as we have used Portuguese before (Alma Mater, Opium) but never on this manner, with this musical background. People seem really into it which leaves quite happy and fearless to experiment more in the future. On a sadder note, two songs on Omega White (new Tears Eve and A Greater Darkness) are dedicated to the late Peter Steele (Type O Negative) and Claudio Paixao respectively. The influence of Peter Steele in particular is evident on Omega White, most notably in the vocals which pay wonderful respect to him and his distinct style. What did these two mean to you personally, and why were these songs chosen to represent that? Peter was an idol and as we have toured together back in 1996 and several times after that, the band became close and enjoyed each other’s company. It was hard to see him go as he had so much to offer and marked a whole generation with his generous talent. I believe such a void will never be filled by anyone else again. We are left with memories, and golden ones, both personally and musically. Cláudio was one of my best friends, I carried him on my lap since he was a child and he was like a part of my family. It was a great tragedy, he died on a freak boat accident, on a recreation travel, trying to save some people from drowning. I paid him a humble homage and a Greater Darkness is a song that is quite difficult for me to speak about but nonetheless one of the most important lyrics I ever wrote. May them both rest in peace. On the touring side of things, what are you most looking forward to in the next year? Any places or shows that you are especially looking forward to? Can we look forward to a U.S. tour in the near future? I look forward to the stage mainly. Being able to defend these songs live is nothing but a privilege. All the rest is hard after almost twenty years in the road, being away, traveling, putting up with demands, politics, the crisis. I always look forward to being in stage, without it I’d be a quite different person, one missing out something really special and that elevates you above your human shell. We already started touring and obviously there are always places we like to go to because people are generous and they offer us their hospitality or because of the challenge and sheer fun which is to play live. There are many emotions one can approach on a tour or in the different shows we play. Best examples are Barge to Hell in December, the metal cruise. We play 70.000 tons two years ago and I couldn’t believe the good spirit everyone shared. So we are anticipating this opportunity again. We’ll also have a cool European tour in November when we will co-headline with Pain for almost a month of club shows. I anticipate our return to Greece a country we love to play in and have many friends to hang out with. And of course Latin America that we are booking right now and where Moonspell plays to larger and very enthusiastic crowds. As far as the States go we already in train of booking something to either January or February next year. We will announce it as soon as we can but I can already let you know that we will, for sure, be one of the headliners and that is great as we look forward to play once again overseas and to get more fans in the process. 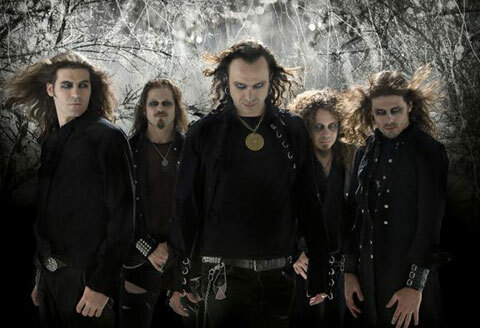 According to Metal-Archives.com Moonspell have been active since 1993, meaning you are quickly approaching your 20 year mark. With ten (11 counting Omega White) albums under your belt, can you explain what it means to you to have accomplished this much in your career, and do you feel we have another 20 years of Moonspell to look forward to? I don’t know. I can only see Moonspell, right now, maybe five years ahead as we have many touring plans and some new ideas for upcoming records. This twenty years were well-lived, between glories and shortcomings, and they went on a flash. We were young wolves and resisted everything and also the world and the scene were way more positive about, well, everything. I am not on a nostalgic trip but I have lived some times in the nineties scene that are hard to relive. So I tend to stay away from that thought, it seems like a really long travel and at this stage of our life as a band we focus more on the day to day survival than anything else. As a final question, what do you feel has been the highlight (or one of the highlights) of Moonspell’s journey thus far? Also please feel free to leave any parting comments for our readers here. Many, too many to choose from. But, as we mentioned him already, I have to say that when Peter approached our table at Tavastia, a legendary Helsinki /Finland club, to introduce himself and cracked a joke, was truly one of the best moments for me. That was 16 years ago! I was 21 or 22 years old. I remember also our first sold out show in Lisbon for Irreligious in an old Covenant, when nobody believed we could do it, and that felt good and it is an incredible memory. But like I say one learns with everything and so far we managed to learn with our mistakes and to keep our head focused in doing quality music , not always the flavor of the day, but definitely from the heart. I thank you for a great interview and apologize for the delay yet these are busy times for us. To all your readers, thanks for your support, hope to see you soon and hope you get the chance to appreciate our new album. As always, thanks for reading and support the artist!